When explaining complex or abstract topics, it is often helpful to represent them visually. Creating a chart or table not only simplifies the concept, but also helps the student retain the information. These tables, like Conducting Patterns, Seating Arrangements and Ranges of All Winds, Strings & Voices, will help illustrate abstract terms and will supplement definitions with concrete examples, making learning simple. 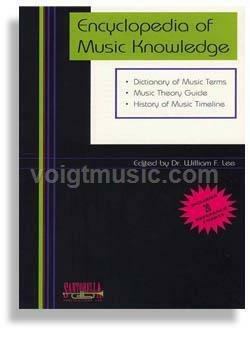 William F. Lee’s Encyclopedia Of Music Knowledge published by Santorella Publications includes 2,500 concisely defined music terms and theory reference charts and features a chronological timeline which covers important dates in music history from 800 AD to present. This incredible listing includes key musical & non-musical events that shaped the music and the people of an era. Santorella’s Encyclopedia Of Music Knowledge is the No.1 collegiate resource for further education in the study of music. Simple enough for layman to understand yet detailed enough for the seasoned musician. An absolute must for any student of music! From Beethoven’s 1st Symphony to the Patriotic Fervor that Sept 11th invoked to Janet Jackson making a spectacle of herself at a Super Bowl half time show. We cover it all! This unique paperback was researched and compiled by William F. Lee III, a highly respected educator, composer, conductor, performer, author, editor arranger and administrator as the former Dean of the University of Miami’s School of Music. Dr. Lee’s commitment to music education goes beyond his university endeavors, it manifests itself in every aspect of his life. Dr. Lee was the co-founder of the International Association of Jazz Educators (IAJE) in 1968 and served as the president from 1972-74 and the Executive Director from 1994-1998. Dr. Lee has contributed greatly to the advancement of music and continues to do so even in retirement. We are quite fortunate to have had his contributions and professional guidance on this project.